There are a few differences when reporting on clients configured to use Forefront TMG as a Web Proxy Client versus SecureNAT (also known as SecureNET) Clients. One of the key differences is that Forefront TMG does not log user credentials for SecureNAT clients. When defining Internet access rules in Forefront TMG for SecureNAT clients, you can only utilize the “All Users” user object, not the ‘All Authenticated Users” object. 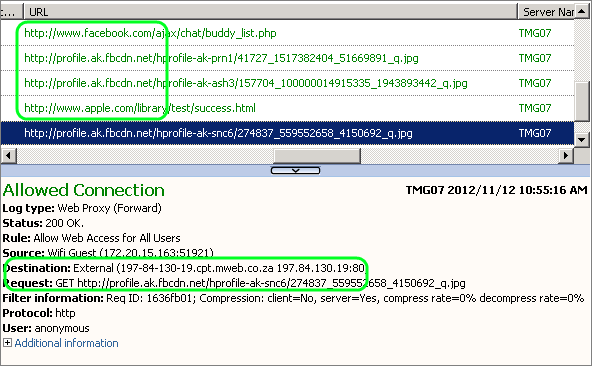 As SecureNAT clients do not authenticate, all the SecureNAT Internet requests are logged as Anonymous. 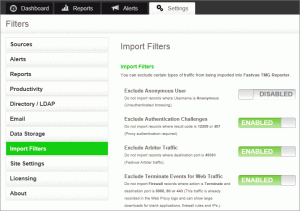 TMG Reporter provides the option to exclude the Anonymous user from being imported (Settings | Import Filters). 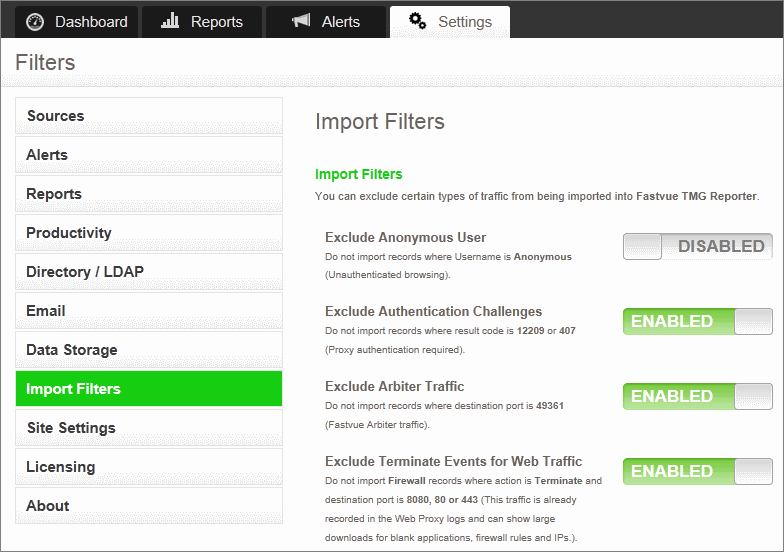 It is therefore important to understand that doing so will exclude all SecureNAT traffic from your reports. The top sites section in TMG Reporter will therefore only contain IP Addresses and not site names such as ‘youtube.com’. This still gives you a good indication of bandwidth used, but you lose the ability to report on real site names. This becomes even more relevant when you realise that a single IP address can be used for many different purposes. For example, the Akamai content delivery network (CDN) utilized by many popular websites could serve resources for nba.com, jetstar.com and facebook.com all from the same IP. This limitation is due to Forefront TMG itself not logging the information for SecureNAT clients. Fortunately there is a solution to this! Microsoft has published a hotfix that enables the logging of hostnames for SecureNAT clients as it does for Web Proxy clients. The hotfix involves saving the script below as a .vbs file, and running it on your Forefront TMG Server. Your Forefront TMG Server needs to be running SP1 or above. 'Declare the other objects that are needed.
' and the network rules collection. On your Forefront TMG Server, double-click your new ‘EnableHotfix980723.vbs’ file to run the script. Once the script has run, open Forefront TMG’s ‘Logs and Reports’ view and run a live query. You will see that any new requests will include the host name in the URL field. This will also reflect in TMG Reporter’s live dashboard. Keep in mind that the Dashboard shows the top sites for the past 12 hours. It may therefore take the 12-hour window to fully clear any ‘IP only’ records from the dashboard. If you want to start with a fresh dashboard showing only the new site names, just restart the Fastvue TMG Reporter service. It is important to remember that reports on dates before the script was run will still only show the IP.
' Create the root obect. 'Declare the other objects needed. Please note there is a formatting error on the Microsoft page. The script is not split into the two separate ones as it is here. You also need TMG SP1 for the script to work. If running the scripts is something that makes you uncomfortable, you can also use the LogHostname Plugin from Collective Software. It does exactly the same thing but it comes at a small dollar price. Also note that you may need to change Forefront TMG’s logging method to W3C text logs to ensure hostnames make it into the log file when using the LogHostname product. See our support issue: Site names still not showing after setting up loghostname. Great Etienne!!! Very good post! I´m learning a lot with your articles! Thank you! I have done above settings and now TMG log show site url. but on my dashboard show IP address even after restart services. Sorry to hear that. Assuming you’re logging to SQL Express, are you able to query your SQL Express database using something like SQL Management studio to confirm if hostnames are being written to the log or not? If not, I’d be interested to see if changing your logging to W3C text logs fixes the issue. We finally identified and fixed the issue preventing site domains making it into the reports. We were pulling this information from the DestHost field instead of the URL field. Even with this hot fix the DestHost field only contains IPs. Once you’re upgraded, the Dashboard will start to rebuild and you should hopefully start seeing site names instead of IPs on the Bandwidth Dashboard. Same for any new reports you run. Old reports will still have IP addresses unfortunately. i am unable to get hostnames. unable to run hostfix file. placed on my desktop. download http://fastvue.co/download but got the blank report. Make sure you’ve installed the Arbiter on your TMG Server, and added the access rule in TMG to allow port 49361 TCP outbound, from the Fastvue Server, to Localhost, for all users. Once data is flowing into TMG Reporter, you should be able to generate reports fine. still i am unable to get the URL names. Fastvue is still egnerating Destination IPs instead of URLs. i have to take the report of last 7 days and when I am generating the report, i am getting IP’s instead of URL’s. please guide me if possible. You should be able to check the TMG to see if it is logging the host names now. Check the Verifying the hotfix section in the article. Once the host names are being logged and you can verify this it will be available in reporter. 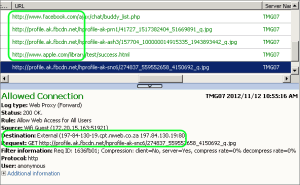 Please note that any logs that were captured before this is resolved will still only show the IP. i ve downloaded the plugin from collective and when i run the installer, prompt appeared that “I could not find any TMG component in this machine”. What build of TMG Reporter are you using? Can I get you to try our latest release available at http://fastvue.co/tmgreporter/downloadbeta. Simply run the new installer over the top of your existing installation. The installer will pick up your existing settings, so just click next throughout the wizard without making any changes. Once installed, browse to the site and clear the browser cache by hitting ctrl + F5 (cmd + R on Mac). Also make sure you’ve applied the hotfix to TMG mentioned in this article. I am using TMGReporter 2.1 but found no luck. I have applied the Hotfix but still getting IP’s instead of URL.